It’s a combination of Elephant Graveyard and Hotel California, this airport in Nortwestern Mississippi, not far from the Mississippi River. Big jets fly into the small town airport, but never leave. I stumbled across the curious goings on at the Greenwood LeFlore Airport during a refueling stop on my way to the Ozark Mountains in Arkansas. Planes which have met their structural or economic lifespan are euthanized, and dissected, after having made their last flight. They are “parted out”, which means useful parts that can be sold, are sold. Presumably the rest goes to scrap. 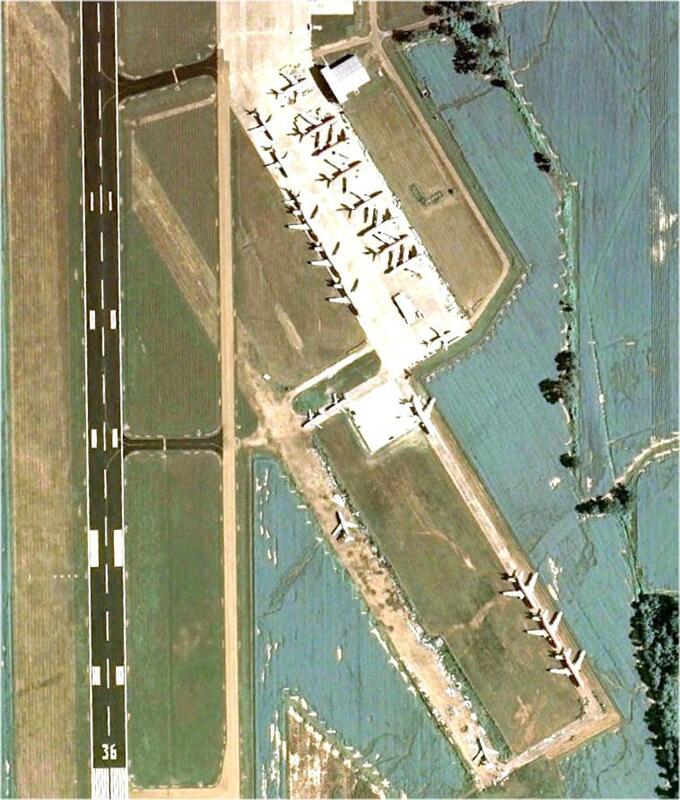 (click for a larger image) In the satellite image of KGWO airport, over 20 passenger or cargo jets are visible on the ramp or the dirt. The facility in Greenwood Leflore is owned by GE, one of the largest manufacturers of turbofan engines. For obvious reasons, the engines are the first to be removed from the planes. But almost anything else with life left in it will be salvaged, and likely used in other aircraft. So why would a plane be scrapped with useful components left in it? 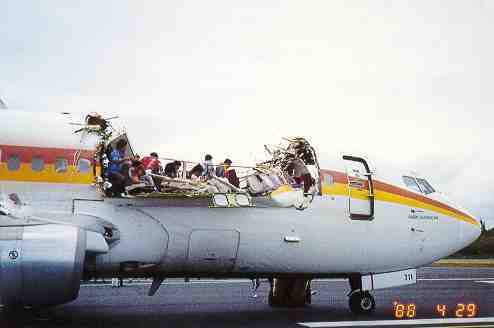 Remember Aloha Airlines Flight 243, a 737 that at altitude lost a large portion of its cabin top due to metal fatigue? Far better to scrap a plane before that happens, than after. Recently, a Southwest 737 had a hole blown in its roof due to metal fatigue accumulation after only 39,000 pressurization cycles. That’s a relatively low number compared to what the industry expects. But let’s put that into perspective. Every morning we wake up, get pressurized, perhaps with a cup or two of Joe, and strike off for our daily chores. And in the evening we depressurize, then sleep, before starting the cycle over. After 39,000 of those cycles, we’d be about 107 years old. Well, sure, if we made it that far, I imagine major things would be wearing out. The funny thing is, aircraft get junked when they are no longer economically repairable. I wonder if that could happen to us? left to right: Frontier Airlines, U.S. Airways, American Airlines variant? Previous Previous post: Those Doctors Are Trying to Kill Me!